Classes are geared for beginners and up. Your participation in YAYA classes supports free community arts programming for New Orleans youth. More classes coming soon! Click here for more events. Make your own glass flower! In this workshop, one of our skilled instructors will guide you through the steps to create your very own flower out of hot glass. Everyone participating in the workshop is required to wear closed toed shoes. Since the studio is on the warm side, please wear comfortable clothing. On your mark, get set, GO! This kids glass marathon is an opportunity to see how many glass pieces you can make in just three hours! This class will teach you the basic skills of glass making while you make up to four handmade pieces with a skilled professional guiding you through every step of the process. Make your own glass cup! In this workshop, one of our skilled instructors will guide you through the steps to create your very own goblet/cup! Everyone participating in the workshop is required to wear closed toed shoes. Since the studio is on the warm side, please wear comfortable clothing. Dive straight into learning the fundamentals of glass! Students will learn the basic skills for making simple blown vessels and sculptures gaining a strong foundation for hot glassblowing. With one-on-one instruction, as well as live demonstrations, students will understand the importance of teamwork and the basics of creating their own designs with this molten material. No experience necessary! What if you had the chance to sculpt everyday objects out of hot glass? This workshop will give you a step-by-step lesson on sculpting pieces like flowers, hearts, birds, and even hands! Students will begin to understand the fluid nature of hot glass by working directly with the molten material. Students will learn to apply color and shape the material with specialized hand tools. This class will also provide the students with a basic understanding of how to work with the material so that they can begin to create their own designs with their skills. SPARK A NEW SKILL OR WORK ON ADVANCING YOUR SKILLS! 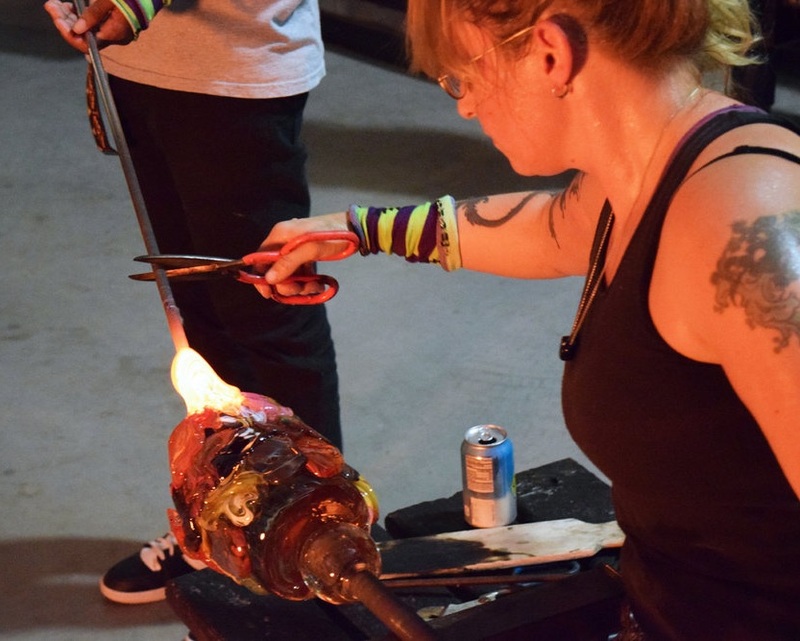 Experience Glass is a private 2 hour glassblowing session scheduled at your leisure. Each class can accommodate up to 2 students. Please call to schedule your blow slot or if you wish to add more students.